Cody Asche -- prior to his injury -- and Freddy Galvis jog onto the field during Phillies Spring Training in Clearwater, Fla.
CLEARWATER, Fla. – A week after he was pulled from full-squad workouts with a minor right oblique injury, infielder-turned-outfielder Cody Asche still has yet to take batting practice and his manager sounded like it could still take a while. “He’s coming along slowly,” manager Pete Mackanin said after the Phillies' 3-2 loss to the Houston Astros at Bright House Field on Thursday. Asche played catch with the team before they took batting practice on Wednesday. He participated in running drills and took dry swings with a bat on Thursday. But he hasn’t seen live pitching in more than a week. While Mackanin was confident that utility infielder Andres Blanco (shoulder) could get back in the lineup as soon as Friday, he didn’t sound as confident about Asche. Obliques can be troubling injuries that linger, as they affect nearly every athletic motion position players make regularly during the course of a game, particularly in the batter’s box. Asche called it “tricky” in knowing when to push forward. “Obviously, the biggest hurdle is hitting,” said Asche, who enters camp opening to win back a regular spot in the Phillies lineup. While Mackanin watched his team claw back but not quite come back to take care of the Astros, his bench coach, Larry Bowa, feasted his eyes on a 13-run, 15-hit attack in the Phillies 13-4 win in Tampa over the New York Yankees in the other half of Thursday’s split squad. Among the many highlights in Tampa: Maikel Franco hit his first home run of the spring, outfield prospect Roman Quinn homered and tripled, catching prospect Jorge Alfaro had two hits and two RBI, Rule 5 pick Tyler Goeddel had two hits and RBI in his spring debut, and Darin Ruf went 2-for-3 with three RBI. Among the lowlights: Former No.1 overall pick Mark Appel walked four of the 10 batters he faced in two innings of work. Jerad Eickhoff (thumb fracture) faced hitters for the first time in a live batting practice session. He could get into his first Grapefruit League game next week. … Three different Phillies had a pair of hits in the 3-2 loss to the Astros: Peter Bourjos (2-for-4) and Odubel Herrera (2-for-5) and catching prospect Andrew Knapp (2-for-3). 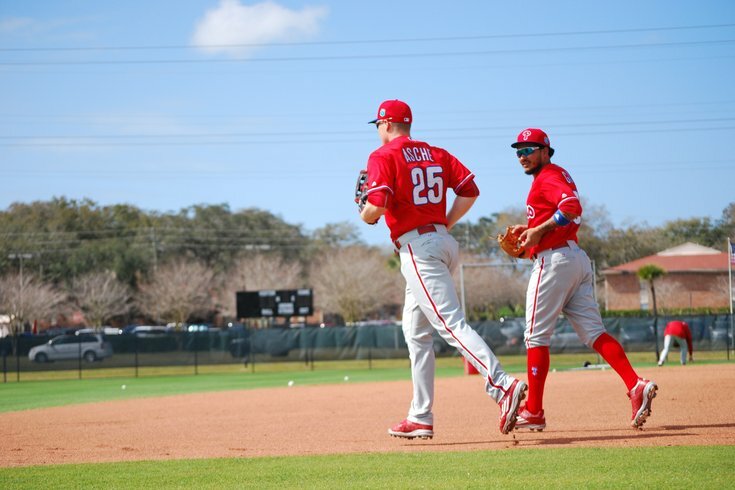 … Jeremy Hellickson makes his Grapefruit League debut for the Phillies tomorrow vs. the Atlanta Braves while fellow right-hander Aaron Nola follows on Saturday against the Toronto Blue Jays in Dunedin. Charlie Morton could see his first action of the spring on Sunday against the Yankees.